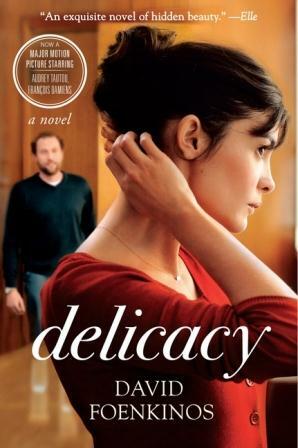 A customer came in and asked about delicacy by Davod Foenkinos, so we got it in around Valentine's Day, and it sold within a few days--but not before I managed to peruse it! It's a French book that has been made into a movie starring Audrey Tatou, who is a great actress. I like the premise, and the writing is quirky and very readable. It's a very quick read, and I highly recommend it! "Natalie and FranÇois are the perfect couple, and perfectly happy. But after FranÇois dies suddenly, only seven years into their still blissful marriage, the widowed Natalie erects a fortress around her emotions into which no one can gain access. Until the most unlikely candidate appears: Markus, Natalie’s Swedish, geeky, and unassuming coworker." It was excellent, and now I'm really eager to see the movie! I hadn't heard about this book but it sounds so interesting! And I would love to see the movie too! This sounds so good! I'm always looking for good short reads. And the French LOVE Audrey Tatou, non? She looks striking on that cover. I recently found Almost Chimpanzee by Jon Cohen in the library. I've just started to crack it open but it looks like it's trying to dispel that idea that humans and chimps are that similar. i love audrey tatou. thanks for pointing this out. the premise of the book sounds good and i'll definitely check it out.